How Do I Wash Curly Hair Weave? "How do you wash curly hair weave that's sewn-in?" Washing sewn-in curly hair weave is a bit like washing a curly lace wig with a twist of washing braided hair extensions. 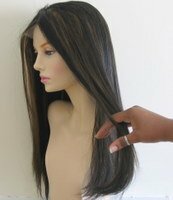 First things first, let's emphasise that this guide is about washing sewn-in hair weave and not glued in hair weave, tape hair or skin weft hair extensions. The images show straight textured hair, but the principle is the same for curly and straight hair weaves. When we wash our hair (whether wigs, weave, extensions or growth hair) the aim is to remove oil (sebum), dust, or styling products from the surface of the scalp, surface of the hair strands and from between the hair strands - we're not trying to exfoliate the scalp and we're not trying to strip the hair strands back to the cortex - this is just a long winded way of saying...be gentle with your hair and scalp when washing. When washing hair weave, the idea is to wash your own growth hair as well as the weave hair extensions... in that order. Mix your chosen cleansing agent (translation; conditioning shampoo or a separate conditioner and shampoo) with some warm water in a spray bottle or an applicator bottle (the ones with the nozzle tips) and set aside. Detangle the hair weave when it's dry using your fingers. Always start at the ends of the hair and work your way towards tracks. Detangling the hair when it's dry means you're less likely to strain the strands of your hair weave, cause shedding or ruin the curly texture and if you didn't already know, human hair is weakest when wet. While the weave hair is still dry, use a wide tooth comb and start combing from the tips of the hair, working towards the tracks; gently tease out any knots without pulling or tugging at the hair. Separate each of the tracks and using your spray bottle or applicator bottle, apply the cleansing agent and water mixture between each of the tracks and gently massage into your growth hair (by massage we mean moving your fingers no more than 1cm back and forth). Do this for all of the in-between-weave-track-growth hair areas and your edges. Spray the cleansing agent and water mixture all over the curly hair weave from track to tip - the hair weave should be dripping but not streaming. Use a wide tooth comb, and starting from the tips of the hair weave, comb the hair weave extensions working upwards to the tracks) in order to distribute the cleansing mixture. Rinse. Yes, that's right, rinse. The shampoo industry has told us that we should be rubbing all of our hair (natural growth hair and hair extensions) all over our heads and lathering up a storm whilst doing so, but in reality all that does is create a whole lot of tangled hair (natural growth hair and hair extensions). So the idea is that you don't rub or massage the hair as frankly it doesn't need to be rubbed and wringed and this way we won't cause the hair to become a tangled mess. If you have a shower, use it; if not, pour lukewarm water over your head hair. Use your fingers to gently massage (1cm back and forth) in between tracks and continue to let water rinse your growth hair as you do this. When you're satisfied that your growth hair is rinsed, separate your curly hair weave into two sections and take hold of one section and gently squeeze as water runs over and through it; start at the top (near the tracks) and work towards the ends. If you have a shower you can keep opening and closing your hand (squeezing) your hair at the same time as the water is running, but don't rub or wring your curly hair weave. Repeat step 4 if you think your growth hair is not clean and repeat steps 5, 6, 7, 8 and 9 if you think the curly weave hair extensions aren't clean. Allows the curls to reshape and reform. If you want to seal moisture into your growth hair and curly weave hair, you should apply your serums, moisturizers or oils when the hair is still damp and use your wide tooth comb to distribute through the weave hair extensions (there are guides about moisturizers for hair weaves and the best hair oils for hair weaves and if you like to condition your hair weave, there's a guide for that too). Leave your lovely curly weave hair to air dry as this is the best way to retain the curl pattern. When you've done this a few times, you'll be a CHWWE (curly hair weave washing expert) and now your hair is lovely and clean you can check out the guide to daily styling hair weave products for hair weave. If you'd like to keep up to date with articles and guides, then join our blog, it's easy and doesn't require any personal info - yay!